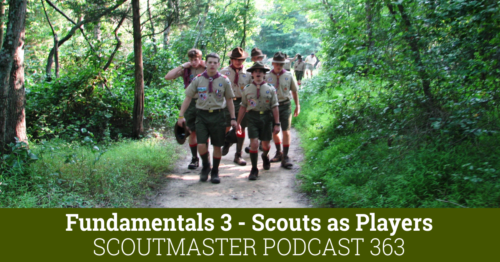 … fills out the analogy of Scouting as a game. Players volunteer to participate in the game. The most important volunteers in Scouting have more power and influence than the highest official. Without their participation, Scouting would come to a complete halt. They bring endless energy, resources, and real transformational power to their role. They are the only volunteers we simply cannot afford to lose. Scouts make a voluntary decision to participate and we Scouters have our positions only to serve the interests and goals of the Scouts. These simple things constitute the framework of Scouting, and they are all that is truly important. The rest is window dressing, it’s nice to have, but not essential to achieving the goal of the game. Our work is maintaining a safe, secure environment for all this to work. We maintain focus, and work with one Scout at a time. thanks for the rant; it put things in perspective for me.